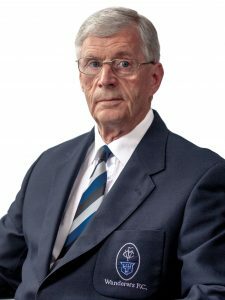 President’s Message – Wanderers F.C. It is both an honour and a privilege for me to have been elected President of Wanderers Football Club for the coming season 2018/19. As the 149th President of this great club, I warmly welcome all our members, friends, supporters and in particular, our visiting teams and match officials to both Lansdowne Road and Merrion Road for what we hope will be a successful season for the club. Since joining Wanderers F.C. in 1964, I have had many wonderful years of enjoyment, not alone on the playing field but off it as well. I have been privileged to play my rugby at almost every level within this club, captaining and coaching a number of junior teams and in latter years having the opportunity to manage some of our more successful senior teams to boot! The friendships that I have made during that time have been long and enduring ones, much valued by me in a world of numerous challenges both within and without this great club of ours. As Wanderers F.C. heads towards its 150th year and the celebrations to follow therein, we as members must all work hard to ensure that the legacy of our club’s founders is secured and that the foundations for the next 150 years are put firmly in place for the future generations to come. It has always been Wanderers ambition to play their rugby at the highest level possible. This coming season will certainly be no exception as we aim for success on the pitch in the true Wanderers tradition! With this in mind, we are extremely fortunate to have secured the services of Patrick Collins as our new head coach this season. He will be ably assisted by our new forwards coach Eoin Sheriff and by our existing backs coach Tommy Ellard. Our Senior management team of David (Doc) O’Connor, Greg Hopkins and Dan O’Sullivan will continue in their respective roles as will our Physio Fionn Daly and our strength and conditioning coach JP Hughes. This senior coaching/management team has the full support of all the club and we wish them, the captain and all the players every success for the coming season. I would also like to take the opportunity to wish the coaches, managers, captains and players of our Juniors, Ladies, under 20s and Minis/Youths all the very best for the upcoming season. To all our sponsors, we thank you once again for your continued generosity and support and for your contributions to various events throughout the season and to our club programme. Our main sponsors are IDL/Pernod Ricard, through their brand “Powers Irish Whiskey”, Leman Solicitors and MSL Ballsbridge Motors and their ongoing support is very much appreciated. We would earnestly appeal to all members and friends to be aware of all our sponsors and support them where possible. Without volunteers Wanderers could not exist, so to all our unsung heroes, giving up their precious time to take on various roles, both on and off the pitch, your time and efforts are much appreciated. To Fergus Moriarty for his continued management of the club events at both Merrion Road and Lansdowne Road, to Nora and Sean in the office without whose dedication and sheer tenacity, the club would not survive and to all the members of the Executive, who do so much unseen work, a renewed thank you to one and all. I am really delighted to be your President for the coming season and together with your Executive committee assure you that we are all committed to taking Wanderers forward both on and off the playing field! I fully intend to represent your club to the best of my ability in my year in office and I have every confidence that our coaches, managers and players at all levels will strive to achieve their goals and so make the season ahead not only an enjoyable one but a successful one as well. Looking forward to meeting you all either in Lansdowne Road or Merrion Road over the next couple of months.